The House of Representatives adjourn the 2015 regular session, which provided the opportunity for the House, together with the Senate, to pass some landmark legislation over gnarly issues that in one instance go back 15 years. During the session, the House approved a five-year extension of Oahu’s rail tax surcharge, provided funding to purchase and preserve lands at Turtle Bay, created a mechanism to allow Maui’s public hospitals to pursue public-private partnerships, and provided for the establishment of medical marijuana dispensaries throughout the state. “From our transportation infrastructure to healthcare, you took on the challenges, even when there seemed to be little hope for success,” House Speaker Joseph M. Souki (Kahakuloa, Waihee, Waiehu, Puuohala, Wailuku, Waikapu) told state representatives in his closing remarks. “Building Honolulu’s rail system has been frustrating. The little distance traveled for the price seems high indeed. But the cost for not taking this first step is even higher and future generations will thank you for your far sightedness and courage,” he said. Souki thanked House members for thinking “outside the box” in resolving Maui hospital’s financial crisis and for working collaboratively with the Administration and Senate on Maui Hospital and a range of other measures. “You also took steps to complete the job of preserving the lands around Kawela Bay for future generations—a task that seemed daunting a year ago. You not only completed that job but re-fashioned a better deal that looked out for the best interest of the people of Hawaii. “You also heard the pleas of those who depend on medical marijuana to make it through each day and provided them with legal access to dispensaries throughout the state,” he said referring to the passage of HB321, CD1, which creates a statewide distribution system for medical marijuana and establishes the parameters for individuals and entities to apply to set up the dispensaries. The Speaker also noted that the Legislature provided more than $28 million in grant-in-aid for nonprofit organizations who reach out to the community with invaluable services and provided over $2.45 billion for a wide range of capital improvement projects, which will continue to support state services and economic growth on all islands. In addition, he applauded the Legislature’s the fiscal restraint in CIP spending and in addressing the state’s unfunded liabilities. “As we move further from the last economic recession, it becomes easier to slip into past practices of borrowing from the state’s Rainy Day Fund and the Hurricane Relief Fund, and spend more freely during good times. You not only refrained from that temptation but continued to address the state’s unfunded liabilities in a responsible and prudent manner,” Souki said. On the last day of the 2015 regular session, the House passed on final reading HB321, CD1, which creates a statewide distribution system for medical marijuana and establishes the parameters for individuals and entities to apply to set up the dispensaries. “There are an estimated 13,000 qualifying patients throughout the state who are desperately looking to find a safe, reliable and convenient access to medical marijuana. 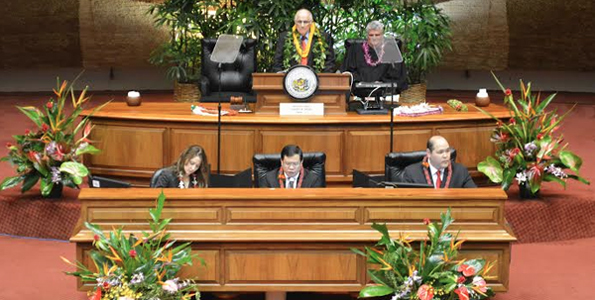 This bill is a reasonable and compassionate response to the needs of our citizens,” said Rep. Della Au Belatti (Makiki, Tantalus, Papakolea, McCully Pawaa, Manoa), who co-introduced the bill along with House Speaker Joseph M. Souki (Kahakuloa, Waihee, Waiehu, Puuohala, Wailuku, Waikapu). Both are long-time supporters of medical marijuana dispensaries. The measure follows closely the recommendations of the Task Force commissioned by the Legislature in 2013 to study the implementation of medical marijuana dispensaries. It also provides for opportunities to improve the system and correct any shortcomings on a go-forward basis. The bill, which also passed the Senate, now goes to the Governor for his signature, veto or passage without his signature. A bill signed into law by Gov. David Ige will make Hawaii the first state in the nation to mandate accommodations for the hearing and visually impaired at movie theaters statewide. HB1272 requires anyone that operates a motion picture theater in more than two locations in the state to provide open captioning during at least two showings per week of each motion picture that is produced with open movie captioning. It also requires them to provide an audio description of any motion picture that is produced and offered with audio description. The measure takes effect Jan. 1, 2016 and sunsets Jan. 1, 2018. A bill passed by the Legislature makes Hawaii the first state in the nation to adopt a 100 percent Renewable Portfolio Standard, which means Hawaii utilities will generate 100 percent of their electricity from renewable sources by 2045. HB623, CD1—which increases renewable portfolio standards to 30 percent by December 31, 2020, 70 percent by December 31, 2040, and 100 percent by December 31, 2045—will boost the state’s local energy industry and save ratepayers hundreds of millions of dollars in years to come. Hawaii has been transitioning from a near-total dependence on imported fossil fuels, doubling its renewable energy production in the last decade. The state currently produces about 21 percent of its power from renewable energy. Hawaii’s current renewable portfolio standards call for 40 percent renewable energy by 2040, which will now grow to 100 percent by 2045. Progress in meeting the existing renewable portfolio standards has saved local consumers hundreds of millions of dollars in avoided energy costs, including more than $67 million in 2012 alone. Renewable energy from new projects currently proposed in the state is now coming in cheaper per kilowatt hour than fossil fuel energy. Accelerating the rate of renewable energy adoption will help advance savings for consumers as the state eliminates its dependence on fossil fuels subject to increasingly expensive and volatile prices. The measure also requires the Public Utilities Commission to include the impact of renewable portfolio standards, if any, on the energy prices offered by renewable energy developers and the cost of fossil fuel volatility in its renewable portfolio standards study and report to the Legislature. HB 1509, CD1 makes the University of Hawaii system the first university in the nation to have a goal of being 100 percent renewable and generate all their own power by 2035, according to Lee. Achieving this goal will save students about $40 million in tuition every year that is now used to pay the university’s electric bill. It will also save taxpayers countless millions by encouraging the use of innovative energy-savings financing to pay for campus upgrades, instead of the state paying the bill. SB1050, CD1 establishes the nation’s first state-wide community renewables program which will allow any resident to buy into a solar PV or other renewable project off-site and receive credit for it on their electric bill as though it was installed on their own roof. This opens the renewable energy market to condo owners, renters, and countless others who previously could not take advantage of renewable technology to save on their electric bill. Big Island legislators secured more than $200 million in Capital Improvement Project (CIP) funding for various projects across the island in HB500 CD1, the state budget bill for the next fiscal biennium. The proposed budget includes funding for various highway improvements, monies for Big Island schools, and continued financial support to complete the Kona Judiciary Complex. The measure is scheduled next week for final reading in both the House and Senate. “We have been successful in securing funds for Capital Improvement Projects for Hilo although we were faced with fiscal restraints,” added Sen. Gilbert Kahele (Hilo). “House District 2 will see funding for schools, infrastructure improvements, and major construction for our airport, harbor, and roads,” added Rep. Clift Tsuji (Keaukaha, parts of Hilo, Panaewa, Waiakea). “I am a strong supporter of alternative learning for our young men and women, and so I am grateful that an additional $1.7 million is being invested for the Youth Challenge Academy in Keaukaha. The Hilo Airport and Harbor continue to receive funding for necessary improvements. “Two of my priorities are farming and agriculture and I am pleased that three projects in Senate District 4 have received funding,” said Sen. Lorraine Inouye (Hilo, Hamakua, Kohala, Waimea, Waikoloa, Kona). “After being invited to visit the Kohala Ditch to witness the damage in December, improvements and repairs to the ditch became my top priority for the future of agriculture. With the collaboration of many constituents and the State Department of Agriculture, we submitted a CIP request and were approved for $1.5 million. “I’m pleased the budget contains funding for North Kohala and South Kohala and makes progress on locally grown produce and much needed improvements for our public schools,” said Rep. Cindy Evans (North Kona, North Kohala, South Kohala). “For Puna & Ka’u districts, I’m happy to announce that our district schools will receive $2.3 million for laptops and the school infrastructure needed to implement the ‘One on one’ computer learning program, starting with Pahoa and Mountain View public schools,” said Sen. Russell Ruderman (Puna, Ka’u). “Lower Puna is the fastest growing district in the State and I appreciate that the current budget recognizes our road and traffic problems by allocating $15 million for improvements to Highway 130,” added Rep. Joy San Buenaventura (Puna). “After many years fighting for projects like the Kona Courthouse, I was so pleased to see our team’s collaboration pay off for the Big Island,” added Sen. Josh Green (Kona, Ka‘u). “The Kona Courthouse was a top priority for me and I’m very thankful that we now have full funding and the project will move forward,” said Rep. Nicole Lowen (Kailua-Kona, Holualoa, Kalaoa, Honokohau). “The funds in the budget for the airport are also really important for Kona’s future—the federal inspections stations will cement Kona as a destination for international arrivals to the state, and the planned regional ARFF training facility will serve as a source of revenue to keep our airports systems sustainable. “We were gratified the two projects in District 5 received grant-in-aid money,” said Rep. Richard Creagan (Na’alehu, Ocean View, Capt. Cook, Kealakekua, Kailua-Kona). “The community kitchen project at Kona Pacific Charter School will receive $1.2 million. This project will help provide healthy food and value added products to the Kona community. House and Senate budget conferees funded $28 million in Grant-in-Aid (GIA) for local organizations serving the public and working to improve the state of Hawaii. The total appropriations, amounted to nearly $20 million in capital improvement projects (CIP) funding and $8 million in operating funds. The funding agreements were made as lawmakers agreed on House Bill 500, relating to the state budget. “This year we received over 280 applications for Grant-in-Aid assistance. It was tough to make a decision from the many worthwhile requests, but the decisions that we made fit into what we could afford in this year’s state budget and our conservative fiscal plan,” said Rep. Ty Cullen (Royal Kunia, Village Park, Waipahu, Makakilo, West Loch), lead House GIA manager.